For those considering a recruitment career in Vietnam, there are many opportunities and advantages. Whilst upping sticks and moving to a Foreign country is not for everyone, for those who do make the leap, there are great openings and a terrific lifestyle awaiting. For those already residing in Vietnam, considering a career with RGF in recruitment might be exactly what you are looking for. Whether you are new to the workplace, or have some experience in an industry, which you would like to use in a recruiting role, RGF offers a great opportunity to build a career. A recruitment career in Vietnam means being the link between employees looking for new staff and candidates seeking a meaningful career change and new opportunities. RGF Executive Search offers the perfect chance for anyone interesting in joining Japan’s largest recruitment group and one of the biggest in the whole region. With years of experience, RGF has a single vision: To bring happiness to every individual with whom we work. We offer market-leading training and fast track career opportunities, coupled with a chance to join one of the world's top recruitment brands. If you are an ambitious graduate or an experienced recruiter, we'd love to hear from you. Most of our recruiters love the idea that they are virtually their own boss. They manage their own accounts, all business relationships and build their own reputation with both clients and those seeking positions. At the same time, you will feel welcomed into a great team offering all the support you need. When it comes to earnings with an RGF recruitment career, the sky’s the limit, with great incentive deals and results based payments, you will be ideally placed to earn big. It is important to understand that this is a tough environment; it’s competitive and professional. That being said, if you are prepared to work hard you will be well rewarded. Results are not an overnight thing. Sometimes finalising a deal can take a few months. You will build a relationship with both sides and this takes time. However, the sense of fulfilment when it all comes together is huge. As rewarding as high earnings can be, so can the building of new relationships with clients and work colleagues. A recruitment career offers people the chance to get out of the office and experience life in the broader business community. As much of this work is now carried out online, it also gives you the opportunity to meet many others in the virtual world. Helping other people realize their dreams can be equally rewarding. Sometimes you will get to steer someone in a direction that they hadn’t even considered. It can be extremely satisfying when all your planning comes together. Taking up a recruitment career with RGF offers you a professional environment in which to hone your craft whilst working alongside like-minded, driven people of all nationalities. Team work is key, and we strive to bring team players in all the time. Slowly but surely we are building towards our goal of being the top recruitment company in the market. We have 7 values at our heart: Integrity, Kaizen (change for the better), Respect, Accountability, Teamwork, Boldness and Fun. We believe in rewarding results and will always fast track the right staff members. The team at RGF are like one big happy family. We all work hard together and often play hard together as well. Managers and staff members interact all the time. You will never be short of colleague from whom to get advice. We encourage teamwork discussions and respect integrity and accountability as core values. With offices in no less than 26 countries across Asia we are superbly placed to attract both top leaders for senior executive to mid-level management positions. We understand fully the need to let off steam, when working in a high pressure area of business. Your role in recruitment career does come with certain pressures. With this in mind we have introduce games and fun events to encourage our teams to engage with each other, interact, and work towards common goals. However, when the need arises to let your hair down and have fun, we wholeheartedly encourage it and make sure there is no shortage of fun activities and opportunities for great socialising. We often get together in some of the countries superb restaurants for group lunches and dinners. We are involved in charity work in Vietnam. Always believing in giving back to the country which gives us these opportunities, we find charity work incredibly rewarding and something that all our staff members enjoy. Twice per year we have our huge company dinner to reward our amazing teams. 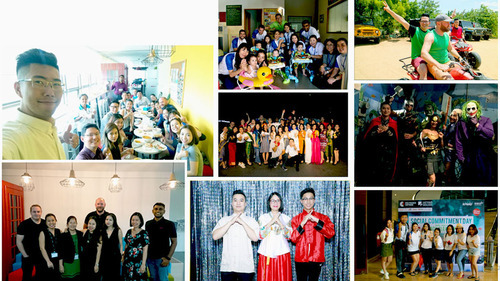 We have days out, bowling events, charity days and many other internal activities. By taking up a recruitment career position with us here in Vietnam, you will be opening the door to the most successful period of your lives so far. Working in Southeast Asia offers people amazing opportunities. The cost of living here is extremely favourable and the standard of living that you will achieve will exceed your expectations. It’s a great life! The right people will move quickly upwards in their recruitment career, making progress and fulfilling their high earning potential. At the same time they will gain life experiences to treasure forever. Working in any foreign country is exciting, working in Southeast Asia tops the lot!